When I’m REALLY hungry and REALLY craving Mexican food, I always opt for a burrito (usually from Chipotle) because it is incredibly filling and ridiculously delicious. However, all the fat, calories and carbohydrates in those tasty burritos can really do a number on my Weight Watchers Points balance. So I decided to try and create an easy, slow cooker chicken burritos recipe that was still flavorful and filling, but for a lot less Weight Watchers Points. Using the slow cooker allowed for my chicken to cook all day, getting nice and juicy and full of flavor. Then, I just assemble the burritos, top them with some enchilada sauce and cheese and give them a quick heat up in the oven. The key to making these delicious burritos low in Points was using low carb tortillas and eliminating the beans and rice. I bulked it up a but with some green peppers and onions, which also added more wonderful flavor. Feel free to add in some extra veggies if you want. If you don’t mind spending the extra points, by all means, add in some beans, corn, rice….whatever you fancy. Top with some optional sour cream and fresh cilantro, and these light Crock Pot Chicken Burritos will blow your mind. A Mexican food lover’s dream, these low calorie crock pot burritos simmer all day, so at dinner time you just assemble and heat quickly in oven to melt the cheese. 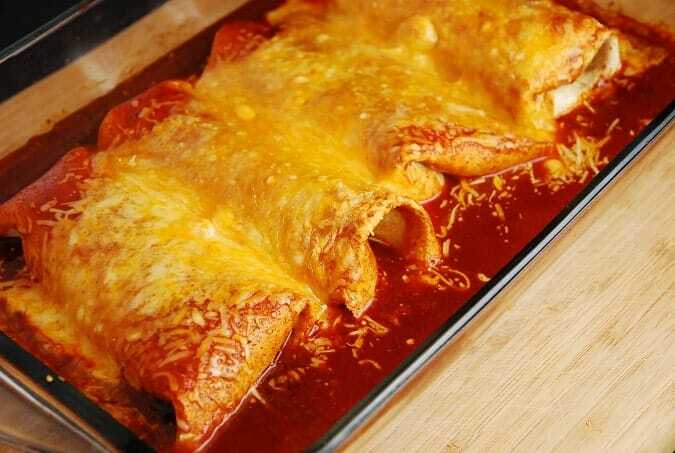 The tender and juicy chicken is perfectly flavored, and the enchilada sauce and melted cheese give it an extra kick. Place chicken, tomatoes, chiles, green peppers, onion, garlic, and taco seasoning packet into a slow cooker and cook on low for about 5-6 hours. Shred chicken with two forks and stir. Drain off excess liquid. Preheat oven to 400 degrees and spray an 11 x 13 inch baking dish with nonfat cooking spray. To make burritos, spoon about 3/4 cup burrito mixture down the center of each tortilla. Top with 1 tbsp shredded cheese. Fold up burrito and place in baking dish. Repeat with remaining tortillas. Pour enchilada sauce over burritos and top with the remaining 1/2 cup shredded cheese. Place in oven and cook until cheese melts and begins to bubble, about 10-12 minutes. Sounds great! I am making this for dinner tomorrow. I have some cilantro left over so I’ll throw that in the pot, too! I’m fairly new to points plus, but could you, or have you, figured this out using a lettuce wrap instead of a flour? I would personally rather have black beans instead of the flour. This sounds like a baked enchilada recipe, not crock pot (as in slow cooker)??? ?